We’ve all heard the rumors about Area 51, the secretive military base in the Nevada desert, where captured alien craft and technology is supposedly hidden away. If it’s true, we wouldn’t be shocked to find out the PowerVision team had enjoyed a tour, and come away with the inspiration for the PowerEgg — an amazing (and very odd-looking) new drone. Sadly, it’s probably not the case (or founder Wally Zheng his hiding something). Instead, he claims inspiration for the drone came from the work of Leonardo da Vinci, but that could just be another government cover-up. The fact that the PowerEgg will appeal to beginners doesn’t necessarily mean the tech inside is basic. 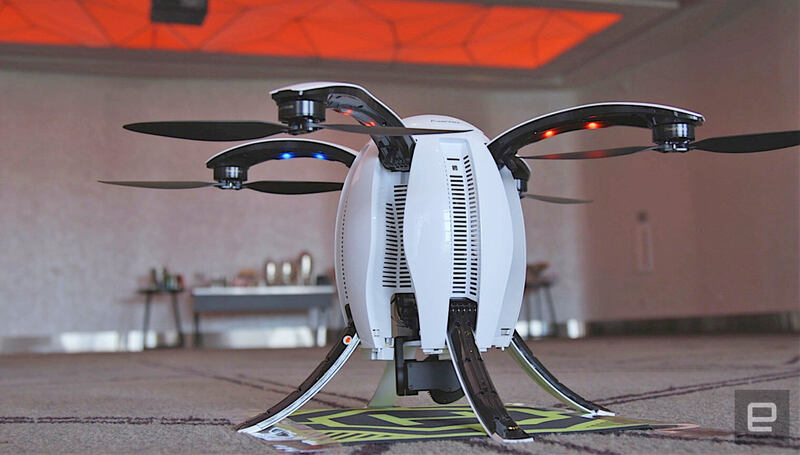 The PowerEgg’s design serves a purpose: to make the joy of flying drones more accessible for everyone — a philosophy that manifests itself in everything from the drone’s camera operation to the flight controllers. Before we get to that, you need to know the coolest part. While the rotor assemblies are extended from the egg manually, the landing gear is retracted and extended automatically, so when the PowerEgg is flying around, those legs are tucked up in the body. If that’s not straight out of a 1950s flying saucer movie, we don’t know what is. PowerVision has been making drones for several years at this point, but this is its first model for enthusiasts, with an emphasis on the first-time owner. The egg-shaped design is friendly, attractive, and easy to carry around. It’s less than a foot tall, and despite weighing nearly 4.5 pounds, it feels like a lot less when cradling the PowerEgg in your arms. The arms pull out from the sides and click into place, and the rotors are spread by hand. A trigger assembly under each arm primes them for folding back inside the body. Folded up, the PowerEgg is easy to transport, and there’s no need to start disassembling it or risking damage by not bothering because it’s a pain. Order the PowerEgg early enough, and you’ll get a custom backpack to carry it around in too. A plinth stops the PowerEgg from rolling away, and placed on a table it could pass for a piece of modern art, it looks so sleek. The battery is hidden under the top of the egg, while the base is removed before flight, revealing the 360 degree camera. The 1/2.3-inch sensor shoots 4K video at 3,840 x 2,160 pixels, and it has a 95-degree field of view. It’s mounted on a gimbal under the egg, and can be controlled in the app. Here’s where the user-friendliness starts to come in. Due to the unusual shape and design of the drone, first-time drone fliers won’t have to work out direction of flight, or quickly learn complex maneuvers to capture great footage. Two controllers are included in the drone package, a regular two-handed, dual-stick controller with a mount for your smartphone, plus another called the PowerEgg Maestro. Think of it like a Nintendo Wiimote, and you’re got the concept. The motion-sensing controller is held in one hand, has a single button for takeoff and landing, and you simply move the remote in the direction you want the drone to fly. Like the design of the PowerEgg itself, this is a far more accessible, user-friendly control system for drone newcomers to pick up. However, the fact that the PowerEgg will appeal to beginners doesn’t necessarily mean the tech inside is basic. The 6,400mAh replaceable battery will return about 23 minutes of flight time, and the software contains many different automated modes, including Follow Me, Selfie Mode, and a Waypoint tracker. It’ll zoom off to a distance of 3.1 miles (allegedly), operate in GPS-free zones, indoors, and has a return-to-home setting in case it gets lost. We had a brief demonstration of the PowerEgg, where the drone took off, retracted the undercarriage, hovered, and landed again inside a large room. Sadly, we will have to wait to try the drone out for ourselves, but did note the PowerEgg wasn’t too noisy, and appeared very smooth and stable during its flight. Like the look of the PowerEgg? Pre-orders start on August 25 for £1290, which is about $1700, and provided that you order before September 30, you get the backpack with it. The standard package includes the two controllers, a battery, base station plinth, battery charger, and the drone itself. Visit PowerVision’s website to grab yourself some (possibly) alien technology.